Do you already own a Kindle or thinking about purchasing one? 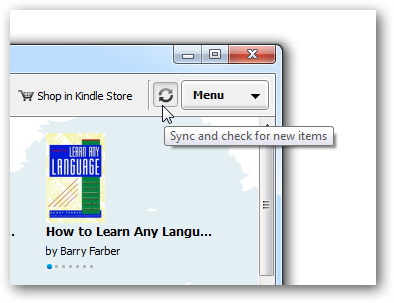 To day we look at a free E-Reader app from Amazon that allows you to purchase and read books from the Kindle Store, and makes syncing your computer and Kindle easier. Note: Windows Only. Mac version coming soon. 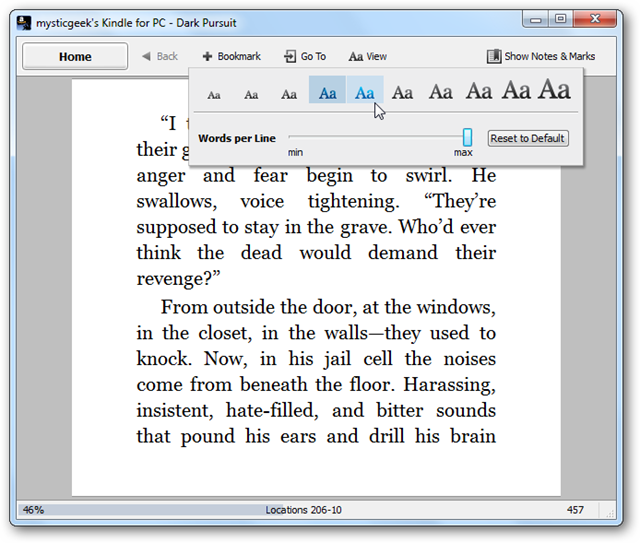 This handy E-Reader is completely free and installs quickly. 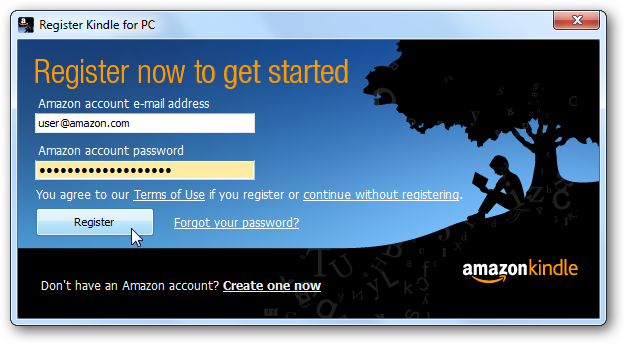 Once it’s ready to go, you’re prompted to sign into your Amazon account. If you don’t have an account and don’t care to sign up for one, you can continue without registering. After signing in you will see the user interface with a couple of balloon tips to get you started. 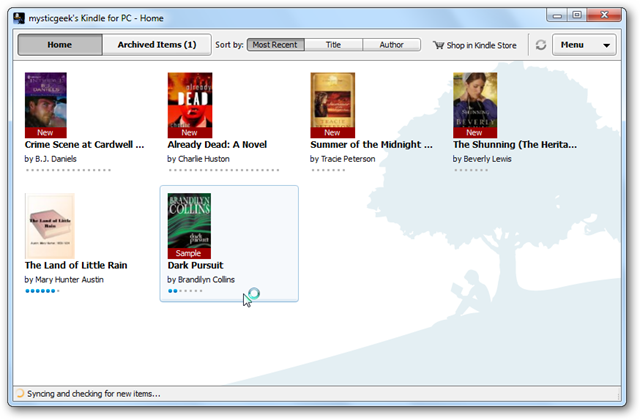 The interface is very slick and intuitive compared to other E-Readers out there. 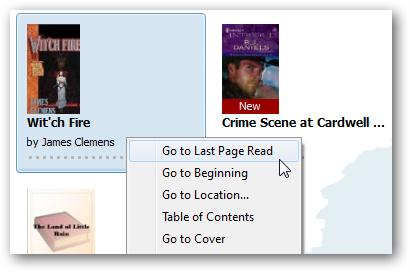 After you have a book loaded, you’ll get navigation controls, bookmarking, and “Go To” which lets you jump to a particular section of the book. There are 10 different font sizes available. 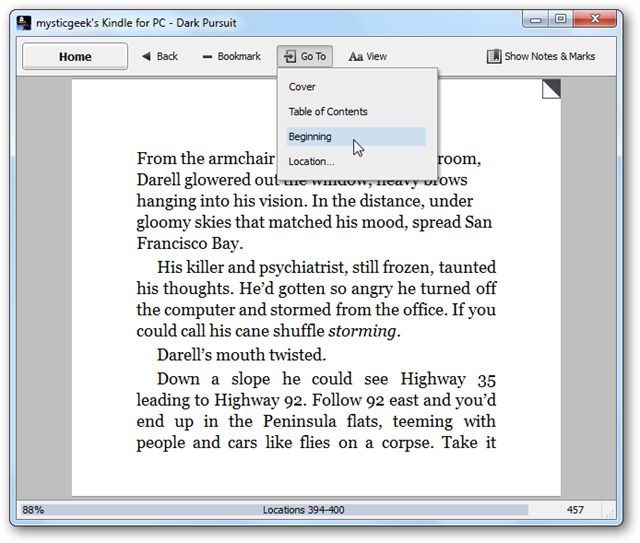 You can bookmark any page in the book as well. 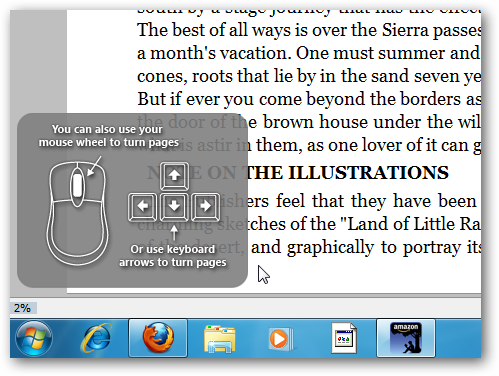 You can navigate through the pages with your mouse or simply use the arrow keys. 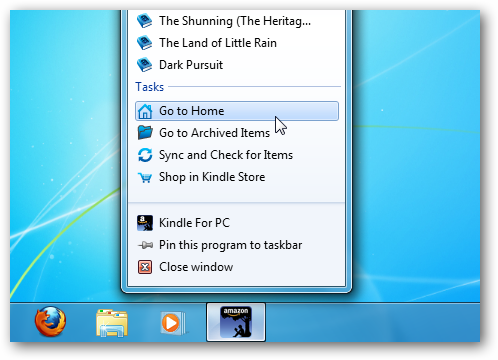 You can access the Jumplist on the Windows 7 taskbar and choose from recent books and other options. 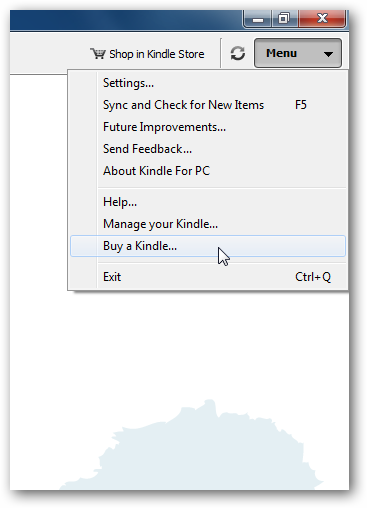 Click on the Menu option on the upper right to access settings, sync items, manage your registered Kindle, and send feedback about the app. Because it’s in Beta the developers want to hear from you how they can improve it. 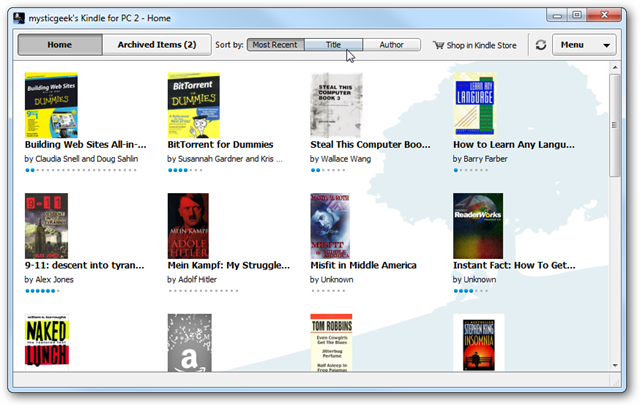 To browse the Amazon store, click on Shop in Kindle Store from the Kindle for PC interface. 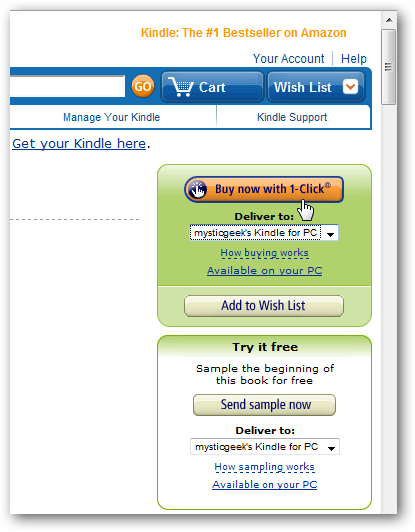 When you find something you like, click on the Buy now with 1-click button and make sure its set to deliver to your Kindle for PC. 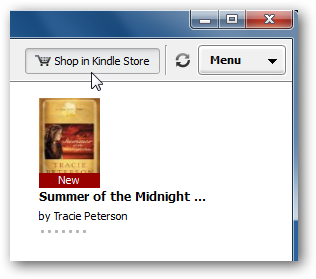 Then on the order confirmation screen click on the Go to Kindle for PC button to pull up the E-reader. 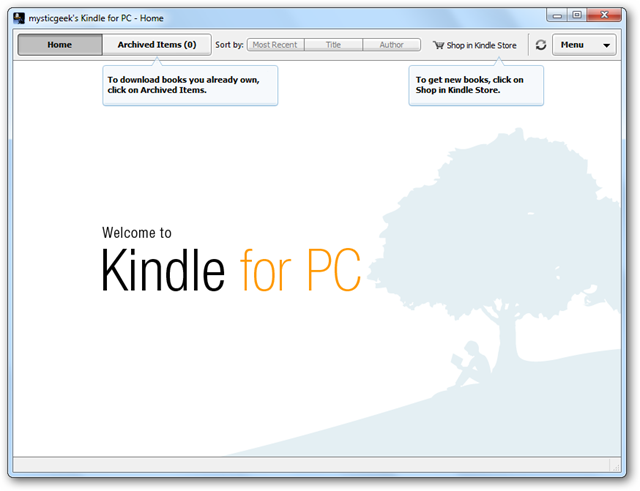 The Home page of the Kindle comes up and you’ll see what books have been downloaded and can monitor the download progress of the one you just bought. Notice in the lower left corner of the reader you’ll see that it’s synching and checking for new items. Another cool thing about the Whisperync feature is it lets you go to the last page you read of a book on the PC, a kindle device, or the iPhone app. 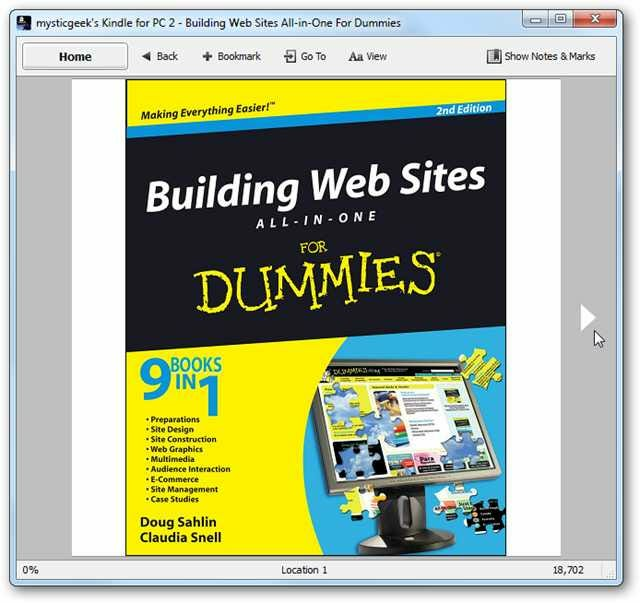 So no matter where you read your books, there won’t be the hassle of finding where you left off. 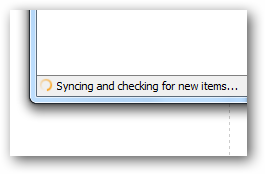 You can sync and check for new items at any time from the button next to the Menu. Once you start getting a larger collection of books, you can sort them by Title, Author, and Most Recent. It’s still in Beta, and there isn’t a search feature or the ability to make annotations yet, but overall it works pretty well and is easy to use. As of this writing it will run on XP, Vista, and Windows 7 but they have a Mac version on the way. Amazon does say the ability to create notes, search, and rotate images in the near future. 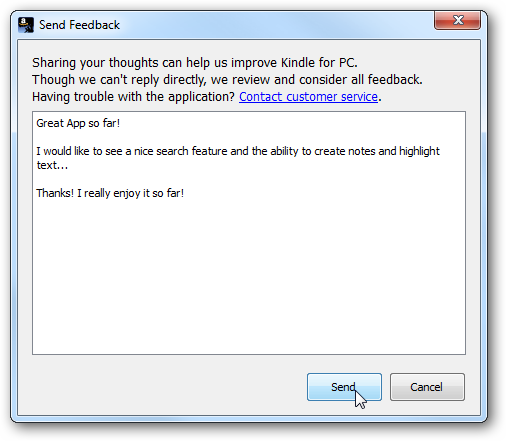 Another thing to mention is it can make use of the Windows Touch feature in Windows 7, so if you have a touch screen laptop it essentially turns it into a free Kindle too. 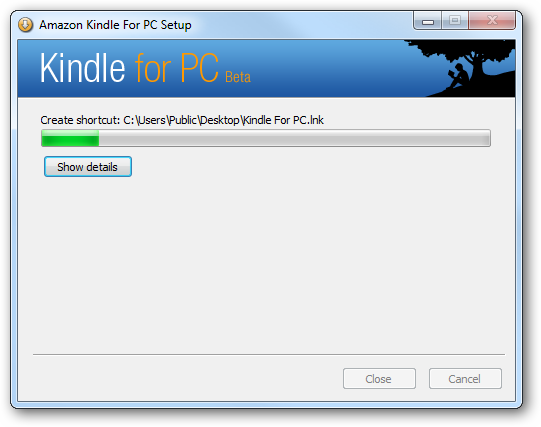 If you’re holding off on buying a Kindle and want to get a feel for how it all works, Kindle for PC is a good way to get started.